Steve Gadd recently celebrated his 70th birthday, and Vic Firth is honouring the occasion with a bunch of new signature gear for the iconic drummer. First up we have The Gadd Padd. This handy 8" rubber silicone pad offers the perfect tool for those on-the-move practice sessions. It also features a rather-fetching 70th birthday logo. That's just the start, Vic Firth also has a new set of Gadd signature sticks. Again featuring that 70th birthday logo, these sticks have a barrel wood or nylon tip. Last but not least is a new Gadd brush. These wire brushes have been cleverly designed by Gadd to rid the drum world of brushes snagging on fresh coated heads. This is achieved thanks to the angle of the brush, meaning these beauties glide across the drums. We're not saying using these new sticks, brushes and pad will mean you nail the 50 Ways To Leave Your Lover beat every time, but it can't hurt, right? 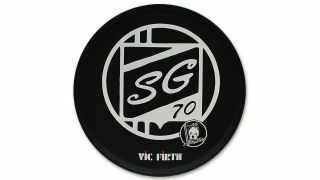 For more information head to www.vicfirth.com.